The year, whatsapp has seen a lot of impressive upgrades ranging from Zip file sharing and call-back support, to GIF support to the most important VIDEO CALLING! which a lot of people are still enjoying. New reports suggest that WhatsApp is testing a new feature that allows its users to ‘revoke’ an already sent message, edit it then send it again. This feature is currently available on BBM and Gmail. The ‘revoke’ feature is said to have been spotted on WhatsApp beta version 2.17.1.869 on iOS. While the ‘revoke’ and edit feature is really cool, what is more interesting about the feature is that the ‘recalled’ message will disappear or get deleted from the receivers’ phone too. How To Tag A User Using WhatsApp New Group Feature! Hope you have heard about the trending new feature by WhatsApp? Yeah right! Well earlier this year, we had a post to inform our users/fans about some features that are available on Facebook and possibly might also be present on Whatsapp since it is owned by Facebook founder and Ceo (Mark Zuckerberg). NOTE: This new feature is available on latest WhatsApp app for all devices so if you haven’t updated your whatsapp to the latest version, I will advise you to do so to enjoy this features. Android user? CLICK HERE to update your device whatsapp. iOS user? CLICK HERE to update. To tag simply enter a group chat and type @ symbol. Then choose participants from the contacts that will pop out or you can tag multiple contacts in a single message. It also works with both Saved contacts And Unsaved Contacts, but Make sure you all are part of the same group chat. If you use smiley with the message it won’t work so while sending such messages that include name, avoid smileys/emoticons! Author etzbigjayPosted on September 29, 2016 Categories Mobile Phones, TechnologyTags Feature, New, New Feature, Tag, User, WhatsApp, WhatsApp Group, WhatsApp UserLeave a comment on How To Tag A User Using WhatsApp New Group Feature! The latest beta version of whatsapp has introduced a new feature which allows you to write text in bold or italic format. By adding asterisks on both sides of the word or phrase you can make it bold, i.e *word* would become bold and adding underscores to the word or phrase would make it italic, writing _word_ becomes Word. Read More – A new ‘Read More’ feature have been added to whatsapp, this breaks a ‘really’ long message just like continue reading on Facebook. I think this a good addition, I don’t know if you guys have also noticed that really long messages crash whatsapp. With this, that would be stopped. Redesigned Settings Menu – The settings on the coming update would also be redesigned and I got to say it looks much better. Your display picture is now in a circle instead of the square it was in before. Link Copying – This is one thing I always thought whatsapp was lacking. Whenever you copy a link from a message, you had to first copy the entire message then paste it somewhere else before you can now copy the link and this is too much work. However, in the new update you can easily copy a link from a message by pressing and holding on the link. This saves you a lot of time. A bit of rearrangement was made in your friend’s profile. Before, when you check your friend’s profile, their status is right under their dp but now, their status is at the bottom. This isn’t really important but I just thought it was worth mentioning. Well, that’s all I could notice in the coming whatsapp Update. 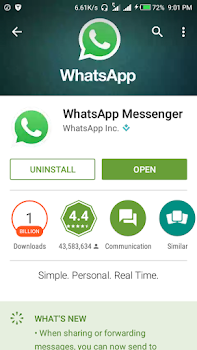 If you love this new features and you want to get the update, you have to Register as a whatsapp beta tester that way, you get to test new whatsapp updates before it is generally released for other people to install. Pretty cool right?